Home Costs > How Much Does Soda Blasting Cost? How Much Does Soda Blasting Cost? Sodablasting is a type of power washing that includes the use of sodium bicarbonate. In addition to the pressurized water, which is able to blast off most dirt and residue, the sodium bicarbonate can help get rid of tough stains on the surface. This method is so effective that one of its earliest uses was to clean the Statue of Liberty. 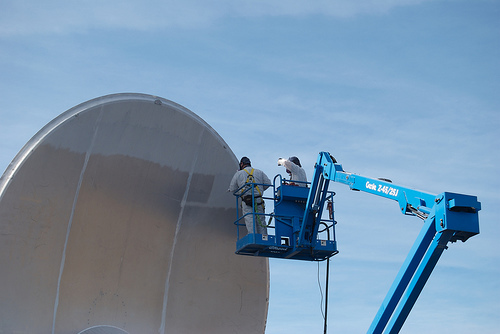 Other applications include paint stripping, graffiti removal, auto restoration, and rust removal. The cost of soda blasting will depend on the surface being blasted, the size of the surface, geographical location and company performing the job. The cost estimates can either be charged by the hour, per part, per linear foot or per square foot. On average, if the professional charges by the hour, then the costs can be anywhere from $140 to as much as $220 per hour. If on a concrete surface, for example, and is quoted by the square foot, the costs could be in the $3 to $5 range. If referring to a vehicle soda blasting job, the costs can be in the $500 to $1,800 range, depending on how much material needs to be soda blasted on the car. For instance, members on Pelican Parts discussed what it would cost to soda blast a car. According to most members, the prices could range anywhere from $300 to $1,000. Members on another forum — bangshift.com — talked about this question, saying it could cost anywhere from $600 for just the cab to as much as $1,000+ for the shell of the car, depending on the size. As for boats, the quotes will almost always be quoted by the foot, with prices ranging in the $45 to $75 per foot range. On TheHullTruth.com message board, members talked about what they paid to have their boat soda blasted. One member, in particular, had paid $1,875 for a 30-footer, while another had paid $2,100 to have a 31-footer done. Lastly, soda blasting concrete will almost always be charged by the square foot, but some may charge per the hour; this is rare, however. Most professionals will charge $3 to $5 per square foot, depending on the complexity of the job, who you choose and where you live. Since so many jobs can be unique, it’s highly advisable you get multiple quotes for free from licensed contractors in your area for free from HomeAdvisor.com. A member on ContractTalk.com, for instance, said he would charge $3 to $4 per square foot for this type of job. If soda blasting a boat, consider the offseason as most professionals will be slow and may be able to offer their services at a steep discount. Considering renting a soda blaster and doing the job on your own if you feel you have the skills to do so. The average rental, depending on your area, should be about $75 to $100.